To learn about Vaikasi Visakam click here. 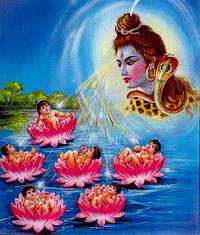 Click here for Murugas birth pictures and pictorial illustration of Jnana Pazham( Mango) or Fruit of Wisdom story ( by clicking the arrows up, left and right above the picture you may move around the pictures) . For further details send an e-mail to: winnipegmurugan@hotmail.com . Click here for contact information.